Whether you’re just starting out or have a project or technique in mind, you can design your own class. Register for an hour-long session of private instruction, $15. Groups of up to 3 can be accommodated at the same time. 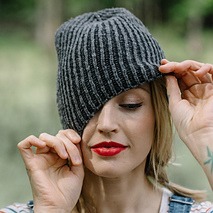 Nothing is cozier than a hat knit in reversible brioche stitch, and Andrea Mowry’s Harlow is an easy introduction to 2-color brioche technique, including decreasing in pattern. Prerequisites: Know how to cast on, knit, purl, increase, decrease, bind off, and knit in the round. Materials: Copy of Harlow (available at GYI), yarn, needles, and notions as per pattern. Note: This is a 2 session class. The second meeting will be held Saturday, March 30, 2:00-3:30pm. With the exception of Knitting 101, basic knitting skills are required to attend our classes. You must know how to knit, purl, cast on, and bind off. If you’d like help mastering the fundamentals before taking a class, please take our Knitting 101 instruction. Payment is due at registration. Fees are non-refundable unless class is cancelled by Gosh Yarn It! Class withdrawals will be accepted with 2 weeks advance notice and store credit will be issued for class fee. If less than 2 weeks notice is given, store credit will be given only if we can fill your space in the class with another student. Gosh Yarn It! reserves the right to cancel or reschedule classes that do not meet the required minimum enrollment of 3 students; class fees can be be refunded or held as store credit to be used for enrollment in future classes or private instruction. Any class cancelled due to inclement weather will be re-scheduled. Supplies for Knitting 101 are included in the class fee. Unless otherwise noted, however, materials are not included in fees. We really do appreciate your business and give participants a 10% discount on all in-stock supplies required for classes. To avoid disappointment with your finished product, we ask that you purchase all your class materials at GYI. Bring basic notions with you to class, including scissors, round and locking stitch markers, a small crochet hook (“fixer”), and a darning needle. Please purchase supplies and wind yarn prior to class. If this is not possible, please arrive in plenty of time before session begins to do so. A yarn winder and swift are available for student use.